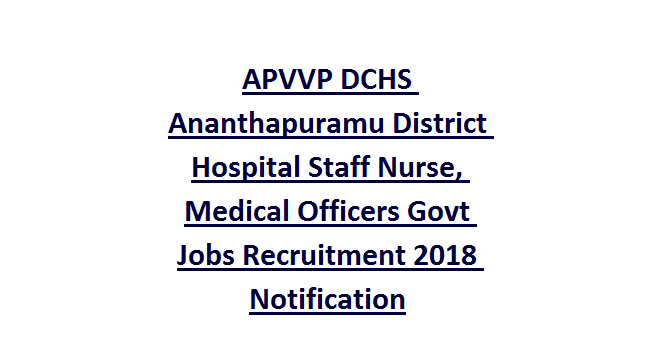 APVVP DCHS Ananthapuramu Staff Nurse Recruitment 2018: Office of the District Coordinate of Hospital Services Ananthapuramu has released a new recruitment notification for filling the Staff Nurse, Medical Officer posts. 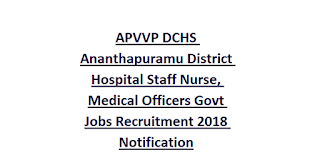 There are total 23 Staff Nurse posts in this APVVP DCHS Ananthapuramu recruitment 2018. For staff nurse posts only female candidates are eligible to apply. For Medical Officer posts Male and Female candidates are eligible to apply. Last date to submit the application form in a prescribed format to DCHS Ananthapuramu District Hospital is 26-12-2018 by 06:00 PM. Detailed information about this DCHS Ananthapuramu Staff Nurse vacancies are given below. There are total 23 posts in this District Hospital recruitment. Upper age limit is 42 years for both the posts. For Staff Nurse Posts: GNM diploma or B.Sc nursing and registration with AP nursing Council. Interested and eligibility having candidates can submit their application form along with all required documents to DCHS Anahthapuramu to the below given address before the closing date. The Office of the District Co-ordinator of Hospital Services, Govt.,General Hospital Campus, Anantapuramu.